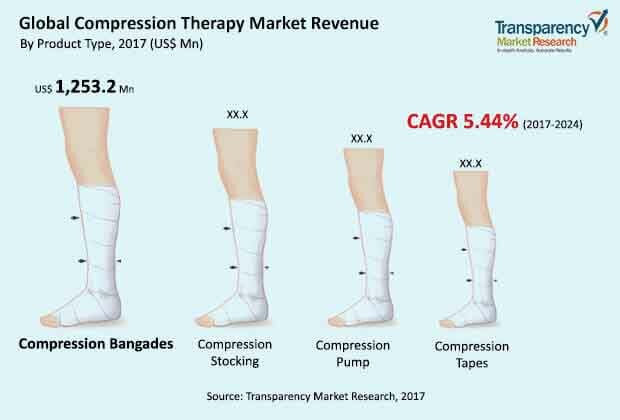 In a recent report by Transparency Market Research (TMR), the global compression therapy market is expanding by merely using sustained pressure in order to overcome blood flow problems in areas like ankles, joints and other veins. The health care industry in market is experiencing a shift off biochemical medication and onto compression therapies or yoga, due to the trending demand for organic ingredients in the food industry. Consumers are now inclined towards therapies offering sufficient relief without causing any side effects. The compression therapy market is fragmented as the players are unevenly dispersed all over the world. Thus, there is no significant player in the market. Established players however face challenges from new players who enter the market frequently. The market is looking forward to collaborate with healthcare units and hospitals to ensure that there is regular supply of demand. Some of the key players in the market are BSN Medical, Bio Compression Systems, Inc., 3M Health Care, Covidien plc, medi GmbH & Co KG, and ArjoHuntleigh. As per TMR reports, the global compression therapy market is estimated to expand into a revenue of US$4.25 bn by 2024. With a moderate CAGR of 5.30%, the market is predicted to grow over the forecast period of 2016 to 2024. Geographically, North America is predicted to rush ahead of other regional segments due to the importance of healthcare facilities in the region. According to 2015 reports, the market revenue generated by North America valued at US$1.27 bn. People are facing a lot of health related issues due to trending lifestyle and food habits. Senior citizens especially are seen to be suffering from various age related problems especially cardiac and orthopedic disorders. The compression therapy proves to be helpful to a large extent to such problems and provides relief without any side effects. Other than that people with orthopedic problems like sports injury or obesity and other dysfunctions seems to be more inclined towards remedies that offers no medication but just efficient care. This shift of preference towards compression therapies have played a major role in providing advantage to the market. Traditional methods of curing injuries have been overpowered by the compression therapy methods. Rise in instances of obesity across the world have added to the advantage of the compression therapy market since the demand for swift and effective treatment is more in case of musculoskeletal injuries. The popularity of various strenuous activities other than sports have increased the number of dysfunctions and injuries. Sports enthusiasts and trainers are advised to adopt compression therapies in case of such musculoskeletal injuries. To pay attention to this need, core specialization methods for compression therapies have started to develop by the healthcare industry. Several under developed countries on the other hand, are facing poor reimbursement policies and due to lack of information and awareness, the prosperity of the compression therapy market is limited or reduced altogether. Despite that, improvement in healthcare infrastructure in developing economies in Asia Pacific are presumed to open enormous opportunities in the years to come. Since the natural expansion for a market player is difficult, market players are coming up with mergers as key business strategy. As more and more people are indulging in outdoor activities the chances of injuries like muscle pull or strain are becoming more common. This is leading to the rise of quick remedy without having to take medicines, thus adding to the advantage of compression therapy market.